Aladaglar (Aladağlar) National Park is situated within the borders of Niğde, south of Kayseri and Adana provinces in the Mediterranean region of Turkey. The name “Ala-Daglar” (Crimson-Mountains) comes from the rusty colour of its hills in the sunset. 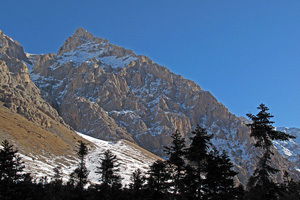 Aladaglar National Park hosts the tallest mountains of the Central Taurus Mountains of Turkey. The area covers four regions as Demirkazik, Yedigoller, Kaldi and Torasanlar, which have their highest peaks respectively as; Demirkazik (Demirkazık) 3756 m, Kizilkaya (Kızılkaya) 3771 m, Kaldi (Kaldı) 3688 m and Vayvay 3565 m. The lowest altitude is 620 m in vicinity of Kapuzbasi (Kapuzbaşı) Waterfalls. Also known as the The Alps of Turkey, Aladaglar mountain region is one of the most popular places for mountaineering, hiking and trekking in Turkey. Hikers and alpinists also have a number of peaks to tackle in the region, the highest of which can be successfully ascended and descended in no more than two day’s time. Depending on the season, you’ll be encountering everything from floral bouquets and goat herds to heavier snow nearer the limestone peaks. If you aren’t into climbing anything, then the Kapuzbaşı Waterfalls are an attractive set of falls that spray straight from a cliff face near the village of Buyukcakir (Büyükçakır); or even just stay the night in a local pension and breathe the incredible mountain air in any of the aforementioned communities. The water streams from the high fountains of the hills and the magnificent glacier ponds surrounded by the mountains are the major national beauties of the region. Additionally the Kapuzbasi Waterfalls lies within the Aladaglar National Park’s borders. Besides these highland beauties the woodland shelters red pine, black pine and fir trees. Aladaglar National Park is also the home of the famous Capra ibex, and other animals like wild boar, wolf, weaser and coyote. Bird watchers all around the world visit Aladaglar as well, to spot the various wild and singing birds of the region. More than fifty endemic plant species have been observed in the area, which was declared a national park in 1995. Nine of these are seen solely in this area. The Aladaglar National Park present rich diversity in terms of bird and butterfly species. Some of the birds of prey one can see are the rock eagle, bearded vulture, and peregrine falcon. Wildlife includes wild goats, bears, lynx and sable. Kapuzbasi (Kapuzbaşı) Falls, consisting of seven waterfalls, is among the places worth seeing. Every year, in late July, participants in the Aladaglar photo safari climb up to 3100 meters. Aladaglar National Park has a total area of 55.000 hectares. The north-western and western parts are within Nigde (Niğde) province 11.464 ha, the northern parts are within Kayseri province 31.358 ha, and the southern and eastern parts are within Adana province 11.702 ha. 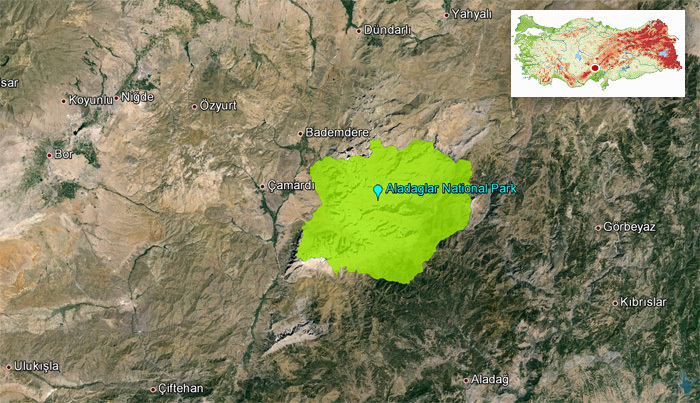 Aladaglar National Park is adjacent to the main highway from Nigde to Kayseri, and can also be accessed from Yahyali. Nigde is accessible by domestic and international flights, by intercity buses, and by car. There are regular minibus shuttles from Nigde to Demirkazik. Aladaglar National Park has extremes of climate, with hot summers and very cold and snowy winters, with snow-capped peaks throughout the year. There is also a huge difference between night and day temperatures, with the lake usually freezing at night yet can reach up to 30°C during the day. Aladaglar National Park has been designated a protected area for wildlife, and there is a specific space for breeding animals. Camping is possible in the park, although there are plans to develop the area and improve the campsite, and create marked trekking and climbing routes. Trout fishing is allowed, and fish is also for sale from the trout production farms around the various rivers.